Continuing its recovery from an acute phase of fiscal performance, jeweler Tiffany & Co. (TIF) reported strong revenues and pre-tax profit in the fourth quarter. Meanwhile, the company’s stock tumbled on Friday when markets opened, in reaction to its disappointing outlook for 2018. At $1.3 billion, net sales of the Superbowl-cup maker grew 8.5% annually in the most recent quarter and exceeded market expectations, helped by robust performance across all product categories and geographies. The topline particularly benefitted from the upbeat holiday season. Comparable store sales growth was 3% on a reported basis, and 1% in constant-currency terms, which came in below analysts’ outlook. Tiffany’s bottom-line growth was restricted by a substantial tax-related charge, which limited net earnings to $0.50 per share, down 60% from a year ago. Excluding the charge, earnings grew 15% to $1.67 per share. Meanwhile, the company said it expects both sales and margins to come under pressure in the near term, from the diversion of funds for investments in production infrastructure and its digital platform. 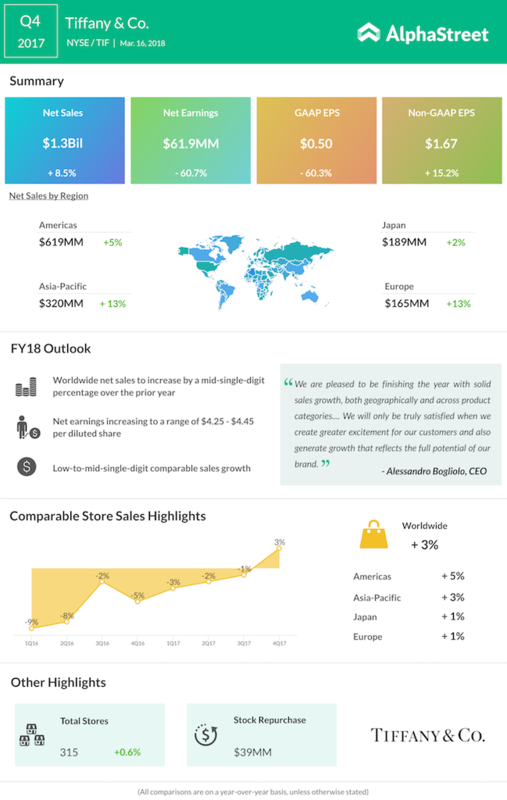 To sustain the turnaround, Tiffany has identified six strategies to focus on in the coming quarters, including a revamp of product offerings and restructuring of the operating model. In the whole of 2017, the maker of NBA’s Larry O’ Brien Trophy closed seven outlets and opened nine, bringing the net store count to 315. During the fourth quarter, a total of $39 million was spent to repurchase around 400,000 shares. In the current fiscal year, Tiffany sees a mid-single-digit sales growth at constant exchange rates. Earnings are estimated to rise modestly to the range of $4.25 to $4.45 per share, after taking into consideration the impact of planned investments, mainly in the later part of the year.